Looking for a way to be able to insult your boss’ wife and STILL get hired for the job? To meet (okay, slightly unstable) women named after wine? To be the most offensive, foul-mouthed – and funniest – teddy bear of all time? Well, somebody must have just wished on a major shooting star, because we’ve found a way to magically turn you from just an average guy into Seth MacFarlane’s Ted. Just like that. Fur and all. And it’s so easy. That’s because it’s a hoodie. 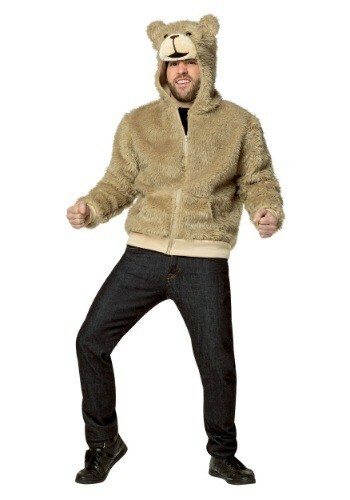 A faux fur, zip-up-the-front, bear-eared-and-faced, Adults-only Ted costume hoodie, to be exact. Would we offer you anything less hip? The teddy bear sweatshirt is perfect for throwing on instead of getting all dressed up in a suit and tie for job interviews. It’ll make you the best-dressed Thunder Buddy ever. It’ll make you irresistible to cashiers. It’ll guarantee you’ll give best impression of John a.k.a. Mark Wahlberg that doesn’t sound too much like Peter Griffin. It’ll definitely NOT make you look like an accountant. Yeah, yeah, we know. You might not have a helicopter with machine guns and missiles. You might not always get all the honey. But you’ll definitely always have this Ted hoodie to make you powerfully vulgar. Wear the hoodie as a Halloween or party costume, or wear it anytime for everyday offending and making fun of everybody. Don’t worry, you won’t get kicked out of any party when you’re wearing it as Ted, especially if you make sure to bring along the…Sauvignon Blanc.